We were introduced to John Anderson via email. He is a Canine Police Officer from Florida, he is an ex-Marine originally from New Orleans, he’s a huge Saints Fan, and he has been diagnosed with ALS. He was looking for an auction item, but that turned into something even cooler. While he was in town this summer, He and Steve were able to meet. Steve took him to the Saints facility to check out the locker room, as this was something he’s always wanted to do. He had a great trip when Steve took him on a personal tour of the facility. 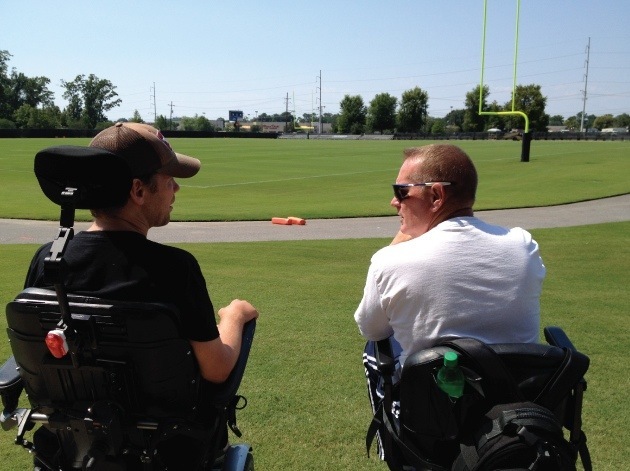 His young daughter foot raced Steve and John in their wheel chairs on the inside practice field. Keep up the fight, John!